Emmanuel Macron looks to have defeated France’s militant rail unions — where next for the movement against his reforms? It has been the riskiest of President Emmanuel Macron’s pro-business reforms to date. By proposing to abolish the employment advantages of tens of thousands of rail workers and to eliminate the French National Railway Company (SNCF)’s legal status as a public company — in critics’ view, the first step toward full-scale privatization — his government chose to pick a fight with the most militant section of the French working class. Yet more than two months after rail unions launched disruptive rolling strikes across the country, vowing a life-or-death struggle, the government has solidly maintained the upper hand. The Senate approved the reform package on June 14 by a 245-82 vote, authorizing the reforms to take effect in January 2020. Labor unions promise to keep striking two days out of five until at least the end of June. After that point, the two most combative rail unions promise to continue strikes in the hopes of swaying contract negotiations with the SNCF. But barring a spectacular turn of events, Macron is poised, yet again, to have his way. Defeating Macron’s reforms was always going to be an uphill struggle. The president’s La République En Marche (LREM) party holds a massive majority in the National Assembly. This means that as with any reform coming from the president’s Élysée Palace, opponents can only hope a combination of protest and negative public opinion will cause the government to apply the brakes. But this never really happened. Public opinion didn’t rally to the side of strikers, simultaneous strikes in the private sector proved short-lived, and civil servants’ unions chose not to throw their lot in with rail workers. And despite all the calls to reignite the spirit of May ’68, the student movement couldn’t muster much by way of support. The early days of the revolt seemed to suggest otherwise. On March 22, civil servants’ unions organized their own round of strikes and demonstrations, protesting a pay freeze and government plans to eliminate 120,000 public-sector jobs. The four major rail unions had already called for their own series of rolling strikes over the next three months. But sensing an opportunity to link their struggle to a broader defense of public services, the two most militant rail unions — the General Confederation of Labor (CGT) and SUD-Rail — called for a demonstration in Paris, in solidarity with public-sector workers. The two marches joined at the Bastille. Turnout was impressive: nearly fifty thousand in the streets of Paris, and between two hundred thousand and 500,000 nationwide. Together, civil servants and rail workers make for a mighty force. It’s just the sort of coalition that, when put into action, could cause the government to back down. What Macron and company feared most was a strike that expanded beyond the particular interests of rail workers — that is, a struggle that called for a broader defense of public services, and indeed the entire French social model, against a government intent on destroying it by a thousand cuts. Though they voted for Macron as president last May, in a runoff contest against the far-right Marine Le Pen, French people continue to deeply value public services. Aware of this, Macron and his cabinet have constantly tried to focus the rail debate on the “unfair” employment benefits of rail workers, flatly denying they have any plans for privatization. Strike levels remained high through the early phases of the movement, with roughly three-quarters of train conductors staying off the job for the initial strike dates. So too did more than 20 percent of the SNCF’s entire 150,000-person workforce, a count that includes white-collar workers less inclined to partake in collective action. At the same time, public opinion seemed to be rallying toward their side. One April 4 poll showed 44 percent of respondents in support of the rail strike, with 41 percent opposed. Ultimately, these trends proved fleeting. From late April to early May, both strike participation levels and public approval began to slip. The former was expected, to some extent. Unlike in the United States, French workers tend not to be compensated by their unions for days lost to strike action. Taking two days off out of every five is a hefty sacrifice. 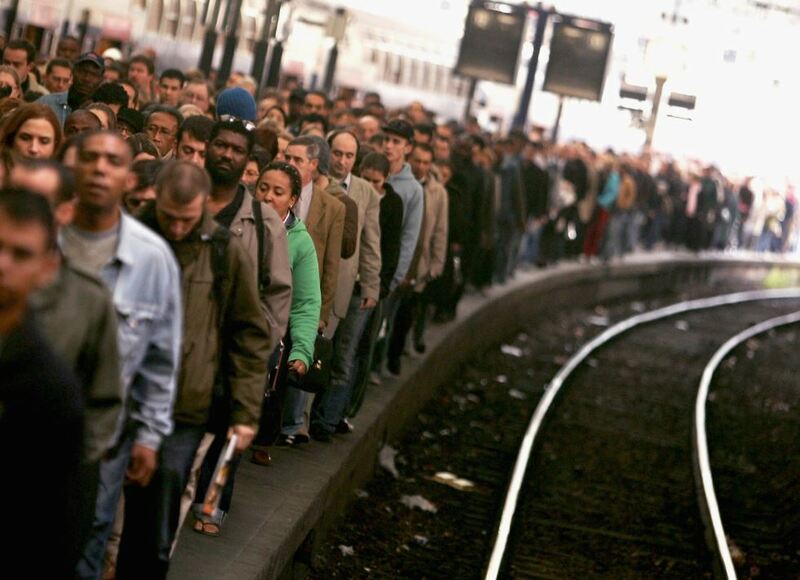 Even so, this year’s rail strike is one of the largest strike movements in more than twenty years, as Le Monde recently reported. In recent weeks, about 15 percent of the rail company — twenty thousand workers strong — was on strike. These figures are not negligible, but they mark a clear decline in strength. Meanwhile, public approval hovers around 40 percent. Support is more pronounced among young people and civil servants. In a recent poll, 56 percent of public-sector workers and 55 percent of those aged eighteen to twenty-four supported the strikes. But clearly, it’s not enough. Rail workers could never win this battle alone. Only with support from unions in other sectors could they realistically think of turning their strike into a larger struggle against Macron’s attempt to tear up the social compact established in the wake of World War II. Recent months did see a flash of private-sector unrest — but it ultimately proved to be just that. In response to a nationwide strike over supermarket closures, France’s largest private-sector employer Carrefour reached an agreement with unions in late April that promised to redirect laid-off employees to other jobs within the company. Protest rolls on Air France: management sought to bypass unions who demanded a hefty pay hike by organizing a company-wide referendum over their own more modest proposal, but employees rejected the offer and forced the CEO to resign. While organized labor is threatening further strikes at the company, it hasn’t spread to other companies or sectors. And Air France unions have been unable to claim a victory. For their part, civil servants’ union leaders have consciously avoided any appearance of tying their demands to those of striking rail workers. They view the latter as a lost cause. On May 22, all nine major public-sector unions joined forces for another round of strikes and protests, but leaders insisted it was altogether distinct from the ongoing train strikes. Not for nothing did they choose a date unaffected by the work stoppage on the railway. “May 22 needs to be centered around civil servants,” declared Laurent Berger, general secretary of the French Democratic Confederation of Labor (CFDT), France’s second largest union confederation. The CFDT advocates a conciliatory approach to employers and the government. In the absence of these extra ingredients, rail unions failed to generate lasting support beyond their natural base: a mix of rank-and-file workers, union activists, and sympathizers of left-wing political organizations. Over the last several weeks, this base has mobilized again, and again. But it simply doesn’t have enough numbers at this stage to defeat Macron. In the preceding weeks it hasn’t managed to reach the same levels as March 22, the day of the largest joint workers’ demonstration. On April 19, a joint call from the CGT and the smaller left-wing union Solidaires for a “convergence of struggles” brought between 119,500 and 300,000 out nationwide. In the annual commemorations of May Day, between 143,500 and 210,000 showed up to protest across the country. On that occasion events were overshadowed by violent confrontations between riot police and black bloc demonstrators in Paris. Left-wing parties tried to inject energy into the movement. Responding to the call of filmmaker François Ruffin (an MP for France Insoumise, the party led by Jean-Luc Mélenchon), around forty thousand showed up in Paris on Saturday, May 5 for a “party” to ironically commemorate Macron’s first year in office. France Insoumise and other parties then went even further. They secured the support of the CGT and other labor unions for nationwide demonstrations on May 26, in which more than thirty thousand demonstrated in Paris. Such unity between organized labor and political parties is rare in France, especially since the CGT dropped its ties to the Communist Party two decades ago. Unions often invoke the Amiens Charter of 1906, a resolution that declared labor’s independence from political parties. This co-operation was a positive sign, but the numbers demonstrate how far it came from exceeding the sum of its parts. College campuses also saw major mobilizations this spring. In protest against education reforms that introduce selective admissions procedures, hitherto confined to only a few elite institutions, student activists launched a series of occupations across the country. The undergraduate campus of the University of Paris 1, known as Tolbiac, saw a particularly intense occupation that lasted nearly a month before it was evacuated by riot police. Student occupations also took off in Montpellier, Toulouse, Rennes, Nantes, and elsewhere. While young people and students generally sympathized with these education protests, the movement itself never became a critical mass. Failed last-ditch attempts to disrupt students’ exams testified to this weakness. By the same token, students in Paris were never able to occupy the Sorbonne for more than a few hours. The symbolism would have been rich: it was in the courtyard of this historic university where the events of May ’68 kicked off. But student activists’ inability to rally enough supporters to sustain an occupation in May 2018 — or at the very least, force more than one intervention from riot police — underlined the movement’s insufficient base. There is also some consolation for the strike movement. Several weeks after the work stoppages began, Prime Minister Édouard Philippe announced the government would take over more than half of the SNCF’s massive €55 billion debt — a longstanding demand from rail unions. This can be seen as a concession — a modest one, but an acknowledgement of the power of collective action. More importantly, the rail reforms managed to do what countless prior reforms prior failed to do: bring labor unions and left-wing parties together on the streets. The May 26 protests, with activists from France Insoumise, the CGT union, and groups protesting police violence marching side-by-side, are an encouraging sign for opponents of the government. This is the most obvious lesson after one year of Macronism, neither organized labor nor the left can defend themselves against this government alone.